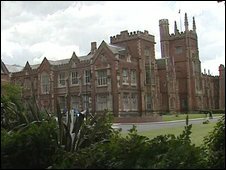 Queen's University in Belfast has been told by the Information Commissioner to hand over 40 years of research data on tree rings, used for climate research. Douglas Keenan, from London, had asked for the information in 2007 under the Freedom of Information Act. Mr Keenan is well-known for his questioning of scientists who propose a human cause for climate change. Queen's University refused his request saying it was too expensive, but it is now considering its position. The university claimed that as the information was unfinished, had intellectual property rights and was commercially confidential information, it did not have to pass it on. After a series of counter claims from Mr Keenan and the intervention of the Information Commissioner, Queen's have now been told that they could be in contempt of court if they do not hand the data over. In his legal decision, the commissioner said that Queen's had failed in its procedural requirements and had wrongly used legal exemptions to withhold the requested information. Mr Keenan, who hopes to use the data to reconstruct temperatures during the Medieval Warm period, said "this has taken three years, but it is worth it. "It is an important victory for FoI on research data," he said. Tree ring data is used by climate scientists to study historical climate information. BBC environment correspondent Richard Black said Mr Keenan's victory has a wider context. "This is the latest development in an on-going process that has seen 'climate sceptics' attempting to obtain raw data and documentation on methodologies from researchers, especially those working to understand the climate of the past, " he explained. "The sceptics' contention is that academics have, through error or will, mis-represented Earth's temperature record so as to portray a picture of a warming planet. "The on-going series of reviews into climate science at the University of East Anglia - the so-called 'ClimateGate' affair - has concluded that scientists ought to have been more open with data than has typically been the case."